Hey, Larry! Glad to see you peeking out again. That is very decent of you, to spend mother's day with your mom. Bread looks beautiful! The slash opening, grigne, crust color and crumb all look beautiful, which reflects your cumulative expertise and skills in cloning breads. I've been admiring your bread works as well! Wow Wally that's a great looking bread and just the kind I love. Give it a whirl. I'm really pleased with this one - and so thankful that Mom inspired it with the loaf she picked up at the store. Wally, that looks great. I've done similar things in the past, but I lke your two cultures and the beer soaker. Will surely try this. I really enjoy being able to use both my levains, and since this bread uses both grains I couldn't resist. Onions, soaked in dark beer? That bread must be good! And looks lovely, too. There must be a German expression to the effect, "Everything is better with beer!" "Alles ist besser mit Bier"
I've been admiring your own works, especially your beautiful dense Gilchester's Miche! I came up with this; Google Translate suggested no editing was necessary. Usually Google Translate provides me with abundant entertainment, but this was really fluent. Dein Deutsch ist aber offenbar auch noch ganz gut. Do you not use the s-z ligature? E.g. Liebe Grüße. 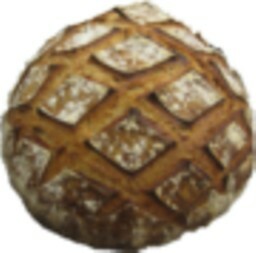 I have to try this, it is beautiful bread that looks delicious. One question, maybe I missed it when I read the recipe but how much beer did you use to soak the onions? Did you drain them after soaking? Thanks. Look back up at the formula and you'll see that I used 150 gr of beer for the 50 gr of desiccated onion. You don't want to drain the liquid. I incorporate the soaker into the levains and water before adding the flours. Thanks Larry, I see it now. Sorry for the bother. I'll make your bread Monday. That sure sounds tasty, Larry. Great looking bread and I love the idea of the long retard. Definitely going on my "do" list. BTW, when I opened your post on my iPad last night, I swear you had a different avatar. Or maybe my eyes were just too tired to see straight. Avatar changed. The small pic of of me (foreground) and my sometime companion and mentor, Miguel at the first bakery I worked at. 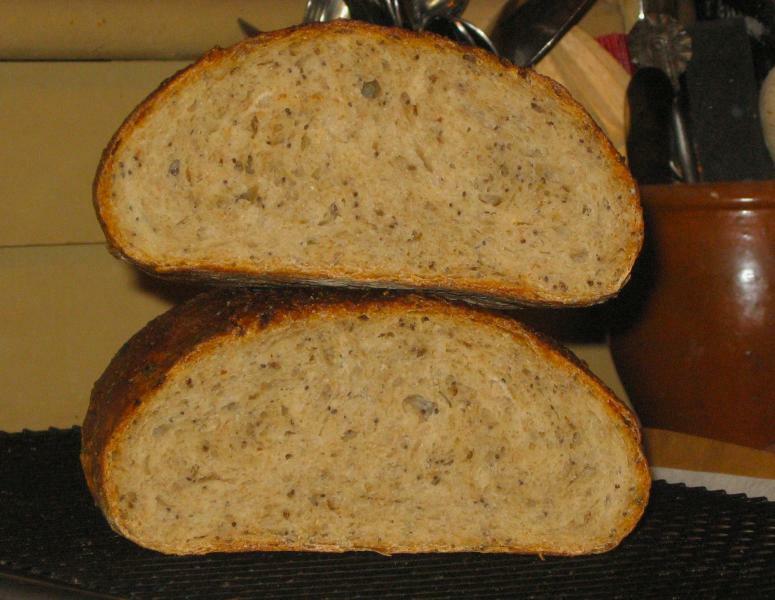 beer, rye and rye sour bread is great looking inside and out - it has to taste fine and make a really great sandwich. Very professional baking all around Wally. Just love your thick crust too. Appreciate your comment. Nice looking multigrain boule you posted up! I've missed the conversations, but I definitely follow the postings and love the breads I see being made and share. What a pleasure to see a post from you Larry, you have been missed! Your onion rye sour just cries out for a mound of steamy pastrami piled on top, don't you think? I'm looking at that nice open crumb and thinking what a good job it would do of holding all the jus and mustard, just the way a good deli sandwich bread should. Awesome bread Larry! I'm in envy of the 40% rye you posted up recently. Just a gorgeous looking loaf and oh, the crumb is spectacular! And yes, this rye does cry out for a good pastrami. This sounds just delicious. It's one I'm going to put on my "to bake" list for sure! You won't be disappointed. And I think our friend Franko has suggested the perfect accoutrement to it. I thought your 80% rye a la Hamelman was beautiful. Nice oven spring for such a rye intensive loaf! with more of your awsome formula's, Larry! The crumb and crust look delicious..Franko really got me drooling with thought of having this bread with some pastrami..oh my! I love the new avatar. I love these type of rye breads. So very nicely written up. Glad you liked this one. I'm very happy with it. Now if I only could turn out the delightful breads I see coming off your wfo.....Oh well, sometimes envy is a nice thing. It gives us something to hope for. ...I'd love to try baking this onion rye of yours, Larry! The beer-onion-poppy seed-rye flavor combination in this one must be *amazingly* good. 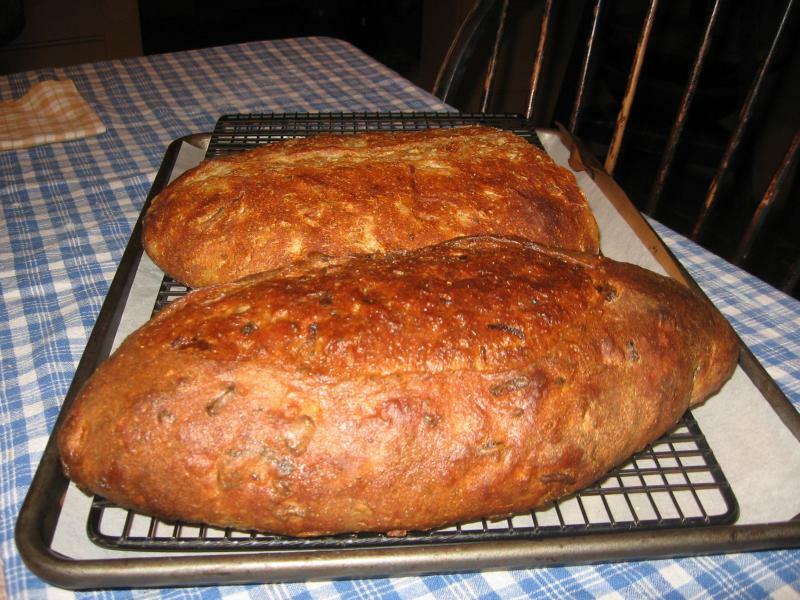 Still remembering your wonderful Cheese bread - and can't wait to try this one! I've been admiring your yummy creations - especially the beautiful tomato focaccia. That's on my to-do list! So kind, Larry - thank you! Larry, that bread looks wonderful. But I am stymied by your formula. It's the first group of ingredients that confuses me. Since the last group of ingredients, listed after the white levain and the rye sour, is labeled "final dough," wouldn't the total weight of, for example, bread flour be the total of the bread flour in the levain and the first group? 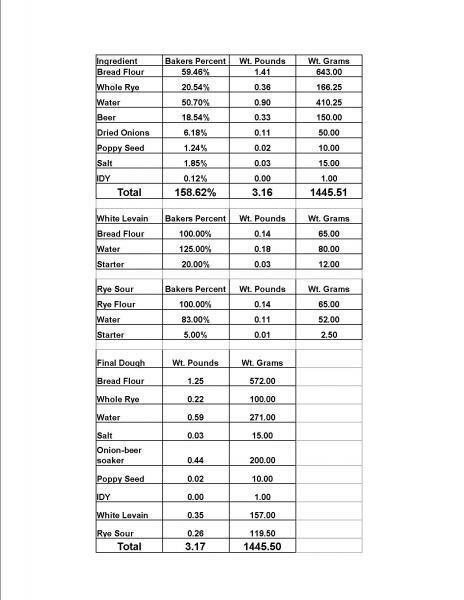 The totals of the bread flour, whole rye and water in the final dough ought to be greater than those in the first group, at least to my way of thinking. But they aren't. Please help straighten this out for me. Thanks! Hi Joy. The initial ingredients listed and totalled (what you call the "first group") represent the overall formula. Below them are the amounts of the above ingredients required for the levain and sour, and below those are the ingredients and amounts constituting the final dough. If you compare the weight listed for the final dough with the weight of ingredients in the overall formula you'll see that they are the same (well, nearly, there's a difference of .01 gram). Your recipe was easy and I'm very pleased with the results...even though we had storm warnings that caused me to turn the oven off and take shelter about 10 minutes into the bake. A half hour later I turned the oven back on and hoped for the best. Worked out well except the second loaf that was rising overproofed and flattened as you can see in my first photo. Still tasty just not high. The house was filled with the wonderful smell of these loaves baking. I did add 1/2 TBLS. caraway just because I couldn't stop myself, we love caraway with rye. Thanks Larry for a great recipe. and great crumb, weavershouse! Glad the recipe worked well for you. I think it was the absence of the heading "overall formula" that got me confused (such a simple matter, isn't it). Well, I've never used beer to rehydrate the dried onions, and these days I've been sauteeing fresh onion instead of rehydrating the dried, but either way this bread sounds like a great new venture. Thank you! how to download the "recipe" chart? Your loaves are making my mouth water and I'd love to give the recipe a try. Unfortunately, whether I try under the original post to get the "printer friendly" version, or cut & paste, the box with the ingredient list doesn't appear. Is there a special way to do this? I have a Mac and am using Firefox. The formula box is an image. The formula box is an image. Right click on it and select 'view image'. Then click on 'File' and select 'Print' from the drop-down. it worked like a charm. I've always been a Mac person and the idea of right or left click is so foreign to me. Thanks for demystifying things.